MILPITAS, CA, February 2, 2017 – CORWIL Technology (CORWIL) announced the addition of a Muhlbauer DS Variation ecoLINE for the processing of wafers to Tape and Reel. With this system, CORWIL has enhanced its volume tape and reel capabilities for chip scale packages and die sorting applications. 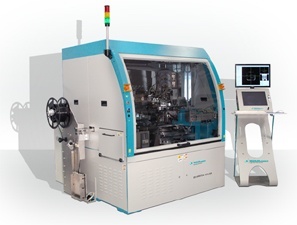 The DS Variation ecoLINE is capable for wafer sizes up to 300mm and features superior vision inspection technology, high speed die flipping, fast tool changeover, and small chip handling capabilities down to 0.5mm x 0.5mm. This addition, coupled with our volume thinning and dicing capabilities, strengthens CORWIL’s capability for the delivery of die level products. “As more of our customers move to die level packaging, CORWIL identified a critical need for a Tape and Reel system that would satisfy these demands. With this equipment, CORWIL has the right inspection and die sorting capabilities to service this growing market,” said Jonny Corrao, CORWIL’s Director of Operations and Engineering. “Our search for the right Tape and Reel partner led us to Mühlbauer High Tech International, who was able to deliver a system that helps us meet the stringent quality requirements of our Mil/Aero and Medical customers as well as providing the flexibility required for Commercial and Quick-Turn builds,” he added. This purchase further emphasizes CORWIL’s commitment to acquire the best equipment and capabilities to support the Semiconductor Industry’s domestic outsourced assembly and test service requirements.